This knowledge brief provides a framework for understanding how teachers’ culturally driven—and often unconsciously held—values influence classroom practice and expectations, and, when in conflict with the values of immigrant and other parents from more collectivistic societies, can interfere with parent-teacher communication. The brief looks at some specific sources of cross-culture conflicts and illustrates some strategies for resolving them. How can teachers avoid the kind of cultural miscommunication that causes unnecessary problems — for them and their students? 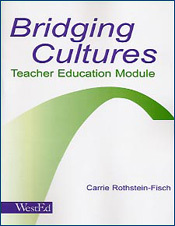 Helping to bridge the gap between teachers and students from immigrant cultures is the goal of this three-hour module for teacher educators and professional developers. 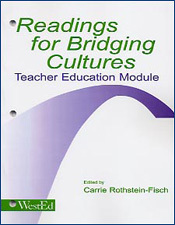 Providing supporting research, theories, and background information to the Bridging Cultures: Teacher Education Module, this collection of readings is highly recommended for presenters, education students, and other audiences as an adjunct to Module materials. Bridging Cultures Between Home and School Institute: Understanding Cultural Differences for Student SuccessWork effectively with students and families whose cultural backgrounds stress the value of collaboration and group effort above individual academic achievement.